One important founding premise of ReinventionWorks is that no one goes through or succeeds at reinvention alone. Sometimes we seek out help and sometimes it just shows up, unannounced, but at the most opportune time. When this kind of help presents itself, if you stop and take a moment to recognize it, you will realize how fortunate you are. You are fortunate to have found someone with the ability and right experience to help you; or someone with the compassion to help you; or someone with whom you can commiserate about your respective reinvention journeys. Or, sometimes help doesn’t come from people at all but from the place and space around you – that kind of right circumstance at the right time. Regardless of the way that this assistance comes to you, it can also do you a world of good to be grateful for it. Gratitude takes you out of your own self-centeredness for a moment (because let’s face it – reinvention is a pretty self-centered process), and helps you recognize that your progress, and the speed of it, can be directly relational to the help you receive. Not only are you not alone, but you are strengthened and improved by the gifts others bring to and share with you. I wanted to create a tangible way for me to recognize my gratitude, a tool I could use to remind myself not only of my good fortune but also of how it continues to grow over time. An idea came to me that correlated most closely to those over-sized fundraising “thermometers” that get hung-up on a wall in a lobby or other prominent place to track the fundraising progress. I liked the idea of tracking progress in some kind of prominently visible way. So I conceived of something on my own. I wanted it to be able to provide a real measurement of each time I received unsolicited words of encouragement, support or atta girl from someone, and I could only track that person’s “contribution” once. I found inspiration in an old goldfish bowl that had been tucked away in my basement. Years ago we had used it as a vessel to hold pennies for a gumball machine we placed beside it. 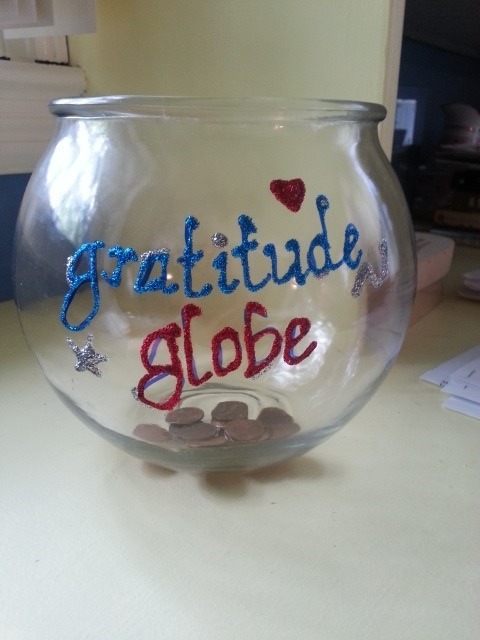 I realized that I could use the clear glass bowl as a perfect vehicle for visually seeing my progress if I turned the pennies into the “currency” with which to track my gratitude. As a kicker, I decided that once I filled the bowl up, I would have a pretty darn clear proof that people believed in me, which goes a long way when you’re in the midst of an uncertain reinvention. 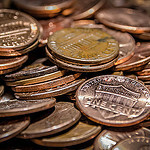 Since I’m a believe in “pay it forward,” I decided that I would take all of that belief-proof (in the form of pennies), cash them in, and donate them to a TBD charity that helps in some aspect of re-birth or reinvention or business startup itself. I cleaned the bowl, bought some glitter glue pens, decorated my bowl, got a cache of pennies, and started putting one penny in each time I got that atta girl. I have a long way to go to fill the bowl, but that’s OK because it’s not about filling the bowl as much as it is recognizing that if it were not for the support of others, I probably wouldn’t be the same person, and I might not even be taking this journey. And for this, I’m incredibly grateful.